Imagine a company, just starting out, and with a really cool product idea. After hiring the right engineering staff to bring the product to fruition, and hiring the necessary executive-level leadership, the CEO decides to move forward building out his marketing staff, with sales to follow one to two years down the road. What?! You’re probably thinking to yourself, “That would never happen. Sales always come before marketing.” However, you’d be wrong and at the most recent The Marketing Alliance (TMA) event, Charles Gold, CMO of Virtru and Sean McVey, Senior Director of Demand at Virtru, showed us just how this scenario can play out – as it did at Virtru. So what exactly is “marketing first?” Per Charles, it’s a combination of two things. 1. A corporate growth strategy led by marketing and 2. A demand model built first on a marketing foundation and then extended to sales, partners, and other channels over time. With so much talk about marketing and sales being out of alignment in traditional sales-driven models, the team at Virtru has found that a marketing first approach ensures greater collaboration and agreement on goals and strategy. However, a marketing first approach does require a change of mindset. Gone is the push and pull between marketing and sales with a focus on MQLs and other “vanity metrics.” Rather, through constant alignment with sales, the marketing team owns revenue metrics, is focused on a digital strategy, is highly adaptive, and is able to develop marketing programs that hit the full funnel (as opposed to focusing only on the top of the funnel). Another difference in this strategy is the size of the marketing team. In a marketing first approach Charles advocates for keeping the marketing team as small as possible. Insource the core capabilities – product marketing, demand, and design — and outsource the rest. To build the best marketing team possible, look for team members who are problem solvers, proactive, cross-functionally aware and who focus on team and goals (rather than tasks and products). With your team built out and regular meetings scheduled to go over goals, you are ready to run with your marketing first strategy, but where to start? The first step is to cut through the noise. As marketers, we are bombarded by a never-ending list of tactics to try (SEO, account-based marketing, retargeting, etc) and reasons to try new things (influence from the board or CEO, following “best practices,” etc.) but this usually ends up with no alignment with the strategic goals of the company and no results worth noting. Instead, the team at Virtru advocates for a phased approach to demand generation consisting of scouting, scaling, and finally supporting. The chart below gives you a sense of when Virtru kicked off each of these phases and when each leveled off. While they believe scouting should be the first thing you undertake in year one, when exactly the next two phases begin – and level off – will be different for each organization. With this strategy in mind, let’s explore further what each stage really means. Phase 1: Scouting – Lay the inbound foundation. During this phase you’ll build a massive index of keyword-rich content and conversion pieces; iterate and experiment on website, messaging, and value propositions; practice and nail sales demos before moving up market; and bring in leads of all shapes and sizes, though mostly small fish. Phase 2: Scaling – Replicate inbound success with paid. During this phase you’ll identify keywords and content driving the organic pipeline and replicate with paid search; increase spending in the first 3-6 months and then cut down to ROI-positive campaigns; use YouTube and display retargeting to provide air cover; and expect a mix of account sizes similar to phase one. 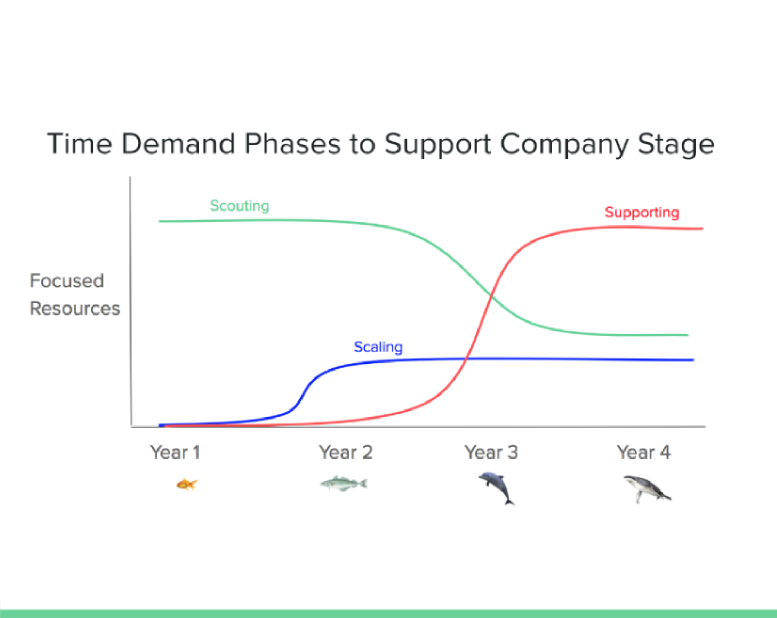 Phase 3: Supporting – Move up market and spear fish. During this phase you’ll move from “nets to spears” while working with sales to define a target list of accounts; shift KPIs to focus on percent of engaged accounts and target account pipeline; utilize tactics like outbound prospecting, direct mail, targeted display, LinkedIn sponsored ads and content, executive events, and webinars; and ultimately you can expect account sizes to be much larger in this phase. Following this strategy, per the team at Virtru, will allow you to track the entire funnel and show that marketing is, in fact, an ROI driver, rather than focusing on MQLs, which don’t necessarily create value. While this approach worked for the team at Virtru, Charles admits it wasn’t something they set out to do but happened by chance. He also cautions that if you are looking to implement a marketing first strategy to be patient and expect many fits and starts. Interested in learning more about Virtru’s marketing first strategy, including some lessons learned? You can view Charles and Sean’s presentation here.